In his travels, he became well known as a man of the loftiest character, a gifted healer and charismatic spiritual leader. He developed a considerable following. Many fantastic legends of his feats of prophesy and miracle-working were recorded after his death, and he came to be regarded as a “divine being.” He is probably one of the models for the syncretistic figure of Christ, many anecdotes in the life story of Apollonius are duplicated in that of Jesus. 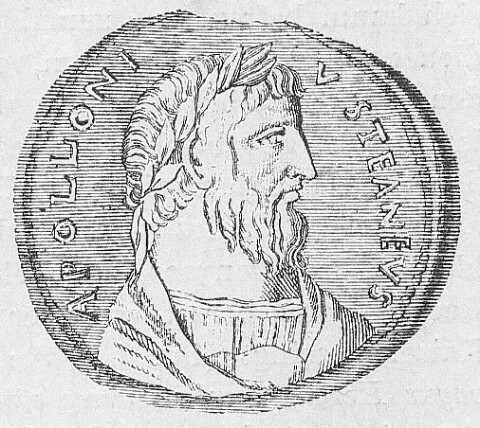 No writings of Apollonius survive, but his detailed life story was assembled from the records of his friends and associates by the scholar Flavius Philostratus (172 – 250 e.v.) at the command of the emperor Severus. Eliphas Lévi’s only recorded act of ceremonial magic was the conjuring of the spirit of Apollonius of Tyana. Lévi also translated a document called the “Nuctemeron of Apollonius of Tyana” which he published as a supplement to Dogme et Rituel de la Haute Magie. Despite the title, the document is almost certainly not the work of Apollonius Tyanaeus.